PDF to DOC Converter instantly converts PDF files into Microsoft Word documents that look just like the original, complete with all formatting and images! Information is set free - free to be edited and free to be integrated into your documents. PDF to DOC Converter is designed to exclude any unnecessary actions or preliminary operations. For instance, it automatically detects the encoding of the source file and makes sure the output will have the same. Even if you have 3- or 4-language document, PDF to Word handles it perfectly. An expert user can also benefit of several conversion fine-tuning options, the command line execution and customizable multiple PDF files batch processing. Yes, that’s right; PDF Converter deals with multiple files just as easy as with one document only. 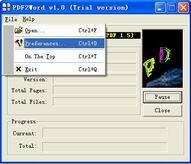 You select them, drag&drop PDF to DOC Converter's Dialog Window, they are converted to Word. Just like that. PDF to DOC software is a standalone program and does not require Microsoft Word, Adobe Acrobat, or even Acrobat Reader. PDF to DOC is a batch PDF Converter that you can convert a lot of PDF files to word documents once time! saving your time! PDF to DOC is a standalone software, MS Word, Adobe Acrobat and Reader NOT required! PDF to DOC supports all version of PDF files. What is Word DOC format? Doc (an abbreviation for "document") is a file extension for a document created by Microsoft Word, the most popular word processing program. The .doc format is used for MS Word versions of between 97 and 2003. The later version of 2007 uses a different format. MS Word was first created in 1983 for Xenix systems under the name Multi-Tool Word. Later newer versions were written for several other platforms like DOS running IBM PCs in 1983, the Apple Macintosh in 1984, and SCO Unix, OS/2, and Microsoft Windows in 1989. The MS Word programs have the ability to create and share documents using a set of writing tools. These documents may include formatted text, images, tables, graphs, charts, page formatting, and print settings. A .doc file uses a text or binary file format for storing the documents on a storage media for use by computers. As the doc file format evolved over a period of time, it can be created and read by other software such as OpenOffice, AbiWord, and KWord. The only thing is that when files created in one program are opened in another program, the high-level formatting like headers and footers, are lost. A main feature of the .doc format, which many find a problem, is the fact that the format is highly variable. In other words, the older versions cannot correctly read, or render files generated by newer versions. For example, a file created in MS Word 2007 cannot be read in MS Word 2003, nor a file created in MS Word 97 be read in earlier versions. This is because the structure of the document cannot be seen; hence the hidden codes of one document of a version make it unreadable in another version. Whatever the case, and despite new word processing software reaching the market, the .doc file of MS Word remains the most widely used application by education, the corporate world, professional organizations, and home users.